Anacortes Washington is a lovely town to visit, whether you're making you way up for a nice day in the sun, or you have a purpose to get there, such as the annual Oyster Run. Anacortes is well worth the trip getting there: From either the north or south, the fastest route is Interstate 5. Yak! But that's not the fun way, now is it? Typical protocol on the slab in past years during the Oyster Run has been WSP stationed all along the route plucking beanie clad bikers and serving up hefty tickets for non-DOT helmets. And who are all these people that run out of gas along the way? I've seen them by the dozens each year. New Sportster owners unaware of the actual range of the machine? In a lot of cases yes. The circus of events continues. Along the exit to Highway 20 West, which gets you into about a thirty minute, feet down on the ground wait, Skagit Harley could easily set up an espresso stand and push it up and down the off ramp helping bikers get their morning latte fixes. I've watched this circus over the years, but I've also settled on three scenic routes that have little traffic, little interstate use and plenty of gas stations and espresso along the way. Some of you will be familiar with these routes; others of you may not yet have explored them. All the routes are based on going north from Seattle, adding about 1 hour to the regular drive time on I-5 without the Oyster Run happening. 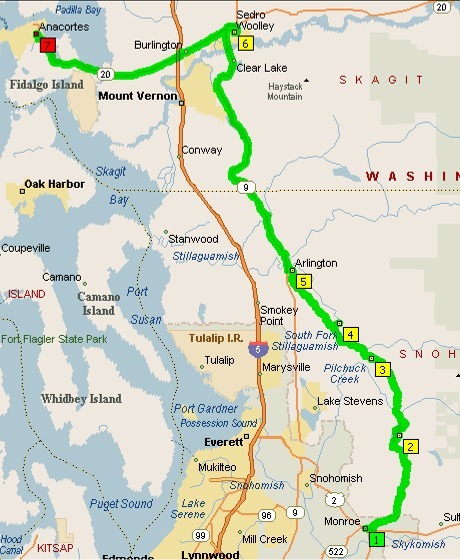 (For anyone coming from the North, Chuckanut Drive is the preferred back way in). Click on the map images for larger maps, but do yourself a favor and pull out a large map of Washington to see the details more closely. A simple, scenic alternative. From Lynwood head for Mukilteo (2) on SR-525. Hitch a ride on the ferry to Clinton (3) and head north on SR-20 along the entire stretch of Whidbey Island. I often return home this way, stopping off at the Captain Whidbey Inn in Coupeville (4) for a waterside beverage on their lovely patio. 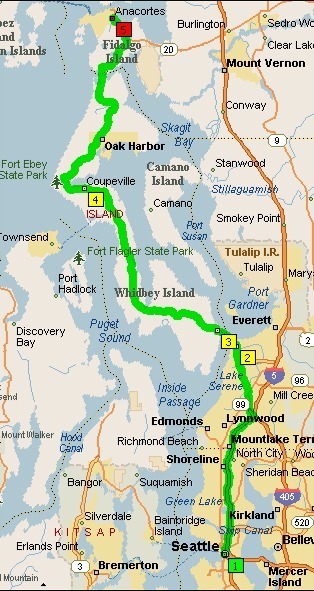 Total time is about 2 hours and 22 minutes from Seattle, but it varies depending on the ferry wait. 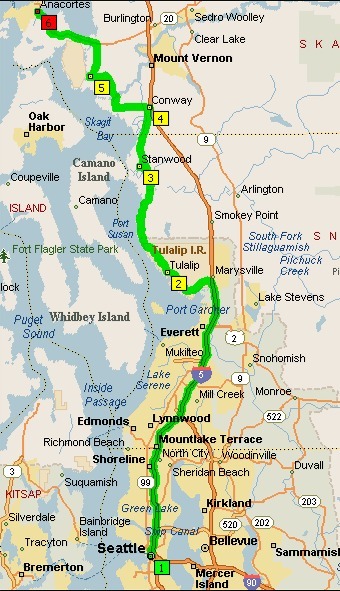 Once you've made it to Marysville kiss I-5 goodbye and take exit 199 heading west out to Tulalip (2). Continue up Marine View Drive winding your way along some sweet twisties lined with lots of greenery. Imagine how nice it would be to have a second home out here as you make your way to Stanwood (3). At Stanwood continue north on SR-530 to Conway (4). Hey, isn't that I-5 off in the distance? But just before you can be sure, you're heading west on Fir Island Road making your way to La Conner (5) and then to Anacortes. Total time from Seattle is about 2 hours and 16 minutes. This is a great route for Eastsiders. Make your way to Monroe (1). Once there take Woods road out to Lake Roesiger (2) and head north to Granite Falls (3). Leave Granite Falls out the back way using Jordan Road (4) heading north to Arlington (5) and we'll save SR-9 for later. In Arlington hop on the fun part of SR-9 riding it all the way to Sedro Wooley (6), sucking up those twisties and watching out for that tavern brawl on the right. At Sedro Wooley go west on SR-20 to Anacortes. If it's Oyster Run Sunday be sure to wave hello to all your brothers on the I-5 off ramp who will be catching up with you in about a half hour, just as soon as they finish those Skagit Harley Espressos. Total time from Monroe is about 2 hours and 28 minutes. Since we ran this story back in 2002 a lot more people are using GPS to navigate. So we've come up with three new routes you can download for use with a Garmin GPS. Several include a romp up to the top of Mt Erie. Depending on which direction you plan to use the route(s) you may need to invert the direction to make it work for your direction of travel. The beauty of GPS is the ability to truly get off the beaten track and explore new roads. So we we've built plenty of that in wherever we could. Have a great ride to and from Anacortes. Click here to request the GPS file now.